Speeding toward pale, icy Dione, Cassini’s view is enriched by the tranquil gold and blue hues of Saturn in the distance. The horizontal stripes near the bottom of the image are Saturn’s rings. The spacecraft was nearly in the plane of the rings when the images were taken, thinning them by perspective and masking their awesome scale. The thin, curving shadows of the C ring and part of the B ring adorn the northern latitudes visible here, a reminder of the rings’ grandeur. 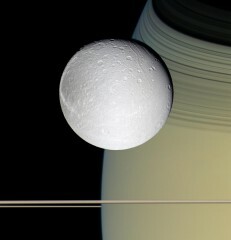 It is notable that Dione, like most of the other icy Saturnian satellites, looks no different in natural color than in monochrome images. This entry was posted in Planets and moons and tagged dione, saturn by Thomas. Bookmark the permalink.